I’ve been in and out of hiatus for awhile (not online so much, as I’m sure many have noticed), and just now finding a moment to mention a bit of what I’ve been up to! For those who haven’t already heard, today (Sunday the 17th of July, 2016) I’ll be presenting a live raw/living/wild food workshop & speaking with my friends Lauren & Ande from Lola’s Botanicals in an open discussion about “Consciousness & Sustainability for All” for VeganEarth’s monthly potluck at Clifton United Methodist Church in Cincinnati, Ohio from 14:00 to 16:00 EST. There I will be sharing recipes, demonstrating raw/live food preparation, and discussing topics relating to synergistic sharing of resources and seasonal abundance with some dear friends who also happen to be organic farming, herbal healing, permaculturist angels! For those interested, I thought it wise to post a blog with some info from the handouts we’ll be using for the event, along with a sattvic revision of an old favourite recipe for pesto (the tamasic version of which had been posted here a few years ago). This is merely a single element of the fresh deliciousness we plan to share with all of you (I cannot WAIT to show you all what Lauren & Ande grow on their farm, and you’ll have to attend (or keep an eye on my Instagram) for full disclosure on how we shall be using it. Rev. Sr. D. Kathryn (Davi / Lady Ⓥ Stardust) – raw culinarian (chef/artist/instructor), Interfaith minister, Ahimsa lifestyle consultant, wellness coach, multimedia ARTivist, re-wilding advocate, and award-winning blogger for RawVeganista.com. Since having committed to a philosophy of non-harm from an early age (& subsequent vegan lifestyle circa May 1990), study toward mastery of plant-based nutrition, healing, and overall physical fitness became key elements for self-care and preservation of personal liberty whilst growing up in a household (& respective community) of non-vegetarians. Following a lengthy professional background in fitness, health, literary, corporate entertainment and media industries, Davi eventually grew tired of “covert” activism and attempting to change things from within a flawed system. New York, whilst studying theology as means to more fully embrace and facilitate her life’s purpose toward healthful, peaceable coexistence within a vast, interconnected community of all sentient beings. Lorax Community, the core foundational project of UNLESS Interfaith Fellowship, for which she has been discovering and sharing various methods for sourcing, cultivation, harvest, and preparation of raw, organically grown, plant-based meals (& assorted creature comforts) using basic principles of Ahimsa consciousness and ”Creation Care”. Visit www.RawVeganista.com to learn more about Davi, find recipes, and become further immersed in Ahimsa alchemy! Lauren Barlag Schewe (Lola) – is a mama, home educator, herbalista and yoga instructor. She and her husband Ande own and operate Lola’s Botanicals, a herbal product line and Communtiy Supported Herbalism share program in Milan, Indiana. Early on, she caught on to the mysticism that nature has to offer and continues to find, explore and experiment with recipes and remedies for common ailments. Lauren has been studying herbs and nature connection for over a decade. and took her to many vast and beautiful places exploring nature, meditation, cooking, herbalism and yoga. She completed her herbalist certification with Rosemary Gladstar and permaculture certification with This Land. Lauren has completed her 300 hr and 500 hr yoga certification through World Peace Yoga in Cincinnati, OH. Lauren seeks and finds oneness in all sentient holy beings. Life on the farm brings her joy, work and play. Care taking for her children and many animals that feed the richness of the farm’s soil. create an abundance of joy for all animals, people and the Earth. Visit www.LolasBotanicals.com to learn more about Lauren, and her enchanting world of resorative herbal wonders! Indiana and owns Lola’s Botanical’s with his wife Lola Lauren Barlag Schewe. He has led plant walks in the Ohio River Valley and the Midwest since 2001. His educational background is a combination of Graphic Design, Natural Resources, Permaculture and Botany. He has a passion for growing local foods, local superfoods and herbs, and has operated his small family farm for over 9 seasons. He offers consultations, botanical surveys, and observational insight. He enjoys researching, educating, experimenting, and feeling seasonal diets and herbs. In cities they call him a Farmer, in rural areas the call him a Gardener. 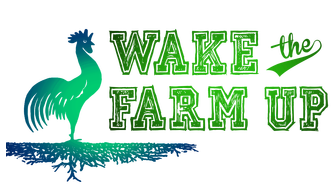 Visit www.WakeTheFarmUp.com to learn more about Ande & his inspiring work! 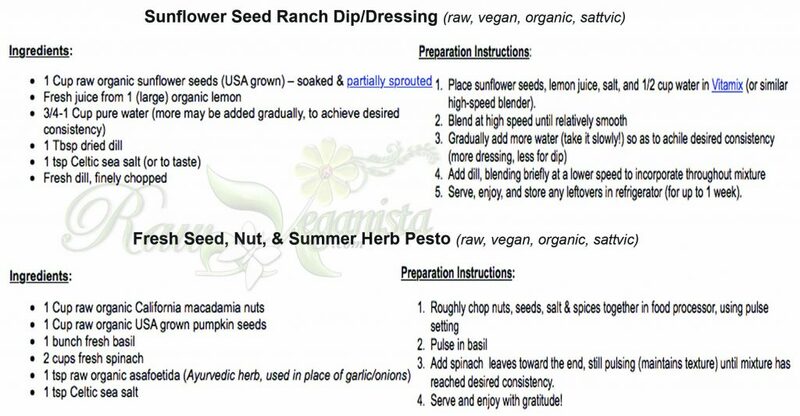 The first shared recipe is for raw, vegan, living sunflower seed ranch dip/dressing, the recipe for which I previously shared quite some time ago via this entry. As mentioned previously, the second is my most recent revision of pesto–prepared in a sattvic-friendly way. Clifton United Methodist Church, in cooperation with VeganEarth – Cincinnati, OH (& all of YOU for attending)! Namaste travellers, and see you next time!